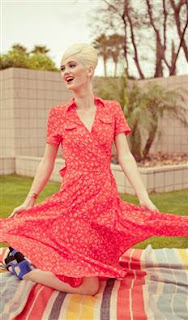 Summer isn't over yet, and there is still plenty of time to wear a cute red wrap dress to picnics and ballgames. Shabby Apple recently contacted me about doing a giveaway of their vintage clothing. I adore their dresses (in fact, I have one myself!) so I was excited to sit down and pick one out for my readers. It was a tough choice! But I finally settled on "Heart of Me" because I loved the wrap style, the red material with a white flower print, and the wide sash. While it is perfect for summer, I think it would also work well in the fall if layered with a sweater. This dress runs in size 0-12, has adorable pockets on the chest, and the skirt is inset with pleats and fully lined. Based on reviews, it runs small, so if you are lucky enough to win you may want to order a size up. Value of $109. Click on the Rafflecopter giveaway to enter! Disclaimer: I did not receive anything in exchange for this post, but I love the Shabby Apple dresses and thought this giveaway would interest my readers. It's pretty, but not my style, so I won't enter this giveaway, but good luck to the others! I love the black ones...maybe ink brush or the movies. I also love the names of the dresses. Wouldn't it be fun to get to be the person who names all those dresses? I really do love the Heart of Me dress, the Bernini is really nice as well! Very cute. Good luck to everyone (I'm not entering). I'm in love with the Eye Candy dress! So chic. I love the EL Mar! This is just adorable, and reminds me of my mother when I was a little girl. Great choice Lisa! and what a fun giveaway! So cute! I'm going to check their stuff out!! Awesome, what a great giveaway! This dress is perfect for summer, and it would transition well into fall too. I've never heard of them before but this dress doesn't look too bad. I'm going to give them a look over and see what else they have that I might be interested in. Thanks for sharing. This is really cute! Great for a giveaway! It is a very pretty dress that you chose!!! I would also like to see YOU in the dress, too. The Heart of Me dress!! Very pretty ! It might be a bit much for me to collect eggs in ...but I love saying " shabby apple "
I haven't worn a size 12 since I WAS 12! Cute little dress---but please don't enter me. I don't participate in Giveaways--but one of your readers will enjoy that little dress. Can I have one of everything!? I would wear it all! The cool thing about your blog is that I would have NEVER have found this online site if it wasn't for this blog post!! Shabby Apple has the cutest things! I really love this color. I also like the ocean plunge dress. I love the Pina Colada dress. My favorite is the Bon Voyage dress. I love the ZIG ZAG STARDUST dress. I love the Jive Talkin' Dress! Amaazing! I love the I'm late, I'm late dress! The Knave Of Hearts Dress is my favorite.